It is rarely easy to make a swift getaway from Battle Mountain unless you do an Eric Ware and leave the Super 8 at twenty-five to dark. I was out of the shower by 07:30 and on the road by ten. When in nomadic mode it'd take half that time at the most, but then in nomadic mode one tends not to keep bumping into wandering FOREIGNS whom one will not see for another 51 weeks. I must have bidden farewell to Team Cygnus at least three times this morning in addition to twice last night. Except Sjaak, who has been loaded into the luggage compartment of the Wielermaker's outsize camper van to get down to the national parks of Utah prior to three weeks of touring. Hope the weather holds, mate. So back along the course for the last time and down to Austin. 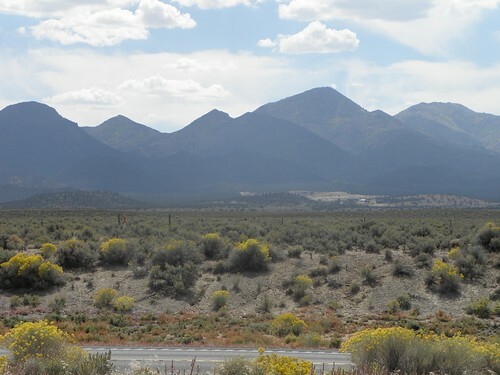 George Leone says that 305 follows, in part, the route of the former Nevada Central Railroad, opened in 1880 to take silver down to the main transcontinental line in Battle Mountain. This is why the bit we use is as straight and flat as it is. Austin is quite pleasant when it's sunny, as it was today, though the main street - part of US-50 - is a bad place to be caught behind a laden tanker truck as it's steep and winding. Yes, since you ask. It also has an establishment called the Wol Club. 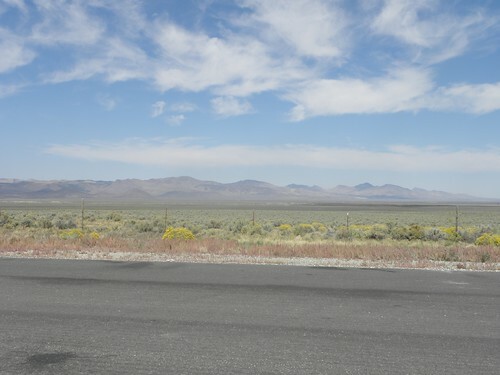 US-50 in Nevada claims to be "America's Loneliest Road" and while it passes through an awful lot of not very much, the traffic on it was like the M1 compared with 305 (two vehicles in 90 miles). It climbs over the parallel mountain ranges following the path of least resistance before striking out across another desert valley. I stopped to replenish supplies of motor-spirit in Eureka, as the readout reckoned I'd run out nine miles short of Ely. I've already found out that it's not 100% accurate, but nine miles from Ely is in the middle of bugger-all and a long walk from the nearest motor-spirit retailer. Eureka is bigger than Austin, and has an establishment called the Wol Club. And a rather grand opera house, built by a madman in 1880 inna-Fitzcarraldo-stylee1. Ely, on the other hand, is big enough that any establishment called the Wol Club may be difficult to spot from US-50. South of Ely US-50 and US-93 engage in an unholy sort of co-existence while poor lonely US-6 ploughs east on its own. I took the latter as the former is also fairly familiar. After Sacramento Summit I left US-6 to its own devices and headed south on NV-487, which turned into UT-21 after crossing a line on the map. 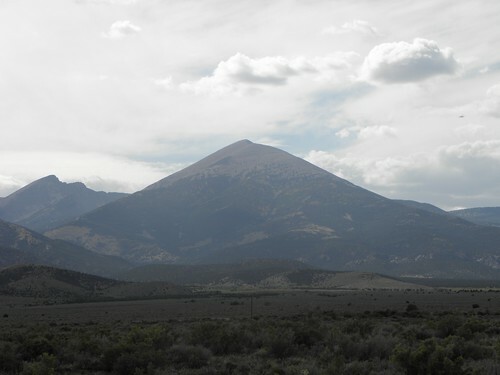 The Nevada end passes Wheeler Peak, wot is the highest proper point in Nevada. Boundary Peak, apparently, doesn't count because its really a chunk of another mountain whose main pointy bit is in Stullifornia. After Minersville things turn unexpectedly green. There is even dairy farming, complete with pong. 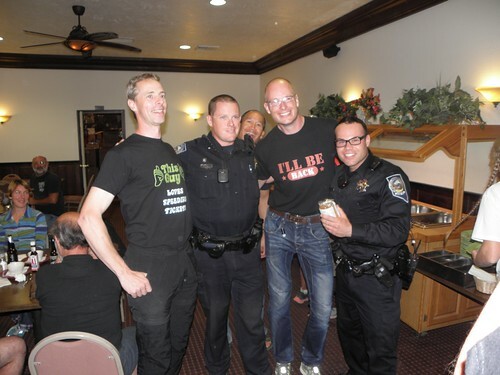 And now Cedar City again, for reasons which will become apparent tomorrow. Probably. Yes, this instalment may be late. I am now back in the Mountain time zone hence today's seven hour drive took eight hours, IYSWIM. On headaches: I have one. Bah! Pizza, Proper Tea and stroopwafels have failed to shift it, so I will go to bed instead. This sentence may contain traces of Lie. The date is correct, though.